On Tuesday morning, record numbers of people volunteered for Riverside County’s annual Point in Time Count of the homeless. Nearly 800 people showed up — about double the number who showed up last year. Nearly a year since the City of Riverside debuted its “Housing First” strategy, officials said they’ll be working hard to find housing for those they count. 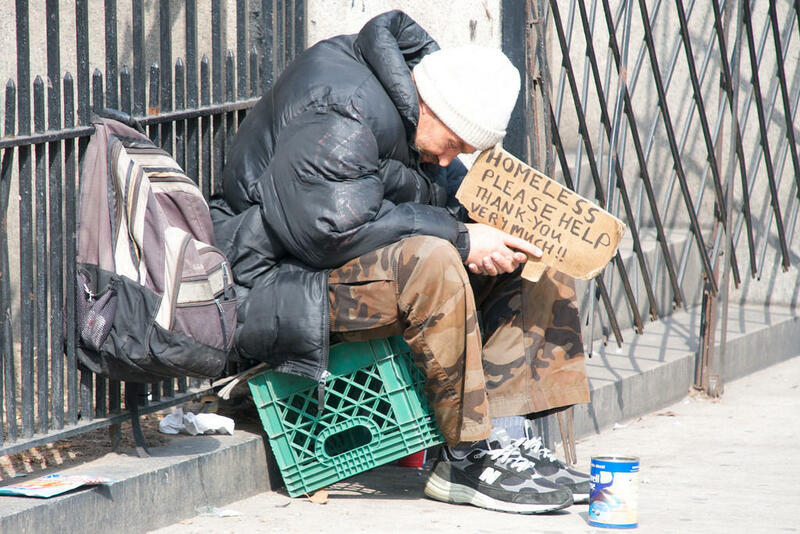 During last year’s Point in Time Count, the City of Riverside counted 366 unsheltered people. Emilio Ramirez, Riverside’s Director of the Office of Homeless Solutions, said he can’t say for sure there will be a reduction this year. “But last count, the last time I saw, it was 292 on the active finding list,” he said. Back in March, Riverside approved its “housing first” plan: a strategy of connecting the homeless with permanent housing quickly, without barriers to entry — like having to get treatment for drugs or alcohol addiction first. In order to house the entire unsheltered population, Ramirez said the city needs to house at least 55 people a year over the next nine years. Since January 2018, they’ve housed 116 people. “So this year, we’re going to break ground on maybe 100 to 150 units,” Ramirez said. There are currently 168 units in the development pipeline. Riverside Mayor Rusty Bailey says there’s been a lot of support from the faith-based community. “After the initiative to, or the challenge to end veterans’ homelessness, we knew we needed another partner outside of the V.A. for the chronically homeless, and so I actively called on the faith based community,” he said. In December, Grove Community Church and the city of Riverside unveiled four homes on the church’s property for families experiencing homelessness. Bailey said he’ll be out in the community volunteering for this year’s Point in Time Count. And then afterwards, he’ll be back to making housing first a reality for everyone counted. “Where did you sleep last night,” Alejandra Larson asked her co-worker Cynthia Whittenberg. “Um...on a bench over there at the park,” Whittenberg said. The two colleagues, who work for Riverside’s Department of Social Services, were at a training, practicing interviewing people for the homeless Point in Time Count. Tomorrow, they’ll join nearly 800 volunteers across the county for the yearly tally of the homeless population. Redlands Has A Big Homeless Population, And No Homeless Shelters. Here's What's Being Done About It. The City of Redlands has declared a shelter crisis, and various agencies are figuring out what they can do to continue supporting the homeless. KVCR's Katie Trojano has more in this feature report. Meet Justin Burzachiello, a 17-year old senior at Redlands High School. Through collaboration with ESRI, a local high-tech mapping company, Justin developed an app called the Helping Humans application. This app helps assist those struggling with homelessness by compiling a list of hotlines, county services, employment assistance, service providers and provisions. Southern California is experiencing a housing crisis. And many communities are looking to build more shelters and affordable housing. But for people experiencing homelessness, what does it take to get off the streets and through those doors? To find out, KVCR reporter Danielle Fox spent a day with a homeless outreach team in San Bernardino. Mike Jones: Could stop it. California Ballot Prop 2: Housing Mentally Ill Homeless Is A Noble Goal, But At What Cost? Should voters approve new housing for an estimated 20,000 homeless people with severe mental illness? While most people agree the end goal of Promposition 2 is noble, there is disagreement over $2 billion in bonds needed to build the homes. Capital Public Radio's Randol White explains. A ruling by the Ninth Circuit Court of Appeals in San Francisco clarifies how cities cxan regulate where homeless people sleep. As Capital Public Radio's Randol White reports, the decision could mean cities throughout California now have unenforceable homeless ordinances.